A superb second-half display saw Lancing come out on top in an SCFL Premier Division thriller with Arundel at Culver Road last night. Lancers were two goals down at the break but turned things around to run out 4-3 victors. It proved to be an action-packed evening which started with Mullets taking the lead after 12 minutes. Returning Arundel striker Ben Gray got it to hand the visitors an early lead. Daniel Momah got his first of the night seven minutes later to make it 1-1. 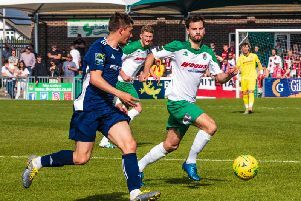 There was a long stoppage soon after as Lancing goalkeeper was forced off following a nasty collision with an Arundel player. Gray then restored the visitors’ lead ten minutes before the break with Harry Russell making it 3-1 deep in first half stoppage time. Lancers were left with it all to do but completed a fine turn around after the interval. Momah bagged his and Lancing’s second of the evening just past the hour, which sparked the home side into life. Brad Lewis levelled things up at 3-3 with 18 minutes left to play and Lancers were now in the ascendancy. There was still time for Lancing to grab a winner, completing a thrilling turnaround. Matt Daniel netted the winner as Lancers ran out 4-3 winners in what was a thriller. n Lancing failed to find a way through ten-man Langney Wanderers as they were held to a draw in their SCFL Premier Division clash on Friday night. Wayne Wilkinson was shown a straight red card after just seven minutes but Langney came away with a point as it ended 0-0 at Priory Lane. John Lansdale and Ryan Knight both wasted good openings in either half with Lancers failing to find a way past resilient Langney. Despite being held to a draw against ten men, Lancers boss Mark Pulling was not overly disappointed. He said: “I think Langney defended really well and made it difficult for us to get through them. “The sending off came so early on and Langney sat back and tried to catch us on the counter from that point. “We did have a couple of chances but just couldn’t get that winning goal. Referee Chris Britton brandished a red card to Wilkinson for a dangerous tackle on seven minutes. Lancing would have been looking to come out victorious with a man advantage for so long but couldn’t find a way through. Lansdale fluffed a good opening in the first half before Knight wasted an equally good chance as it ended goalless. LANCING v Langney Wanderers: D’Cruz; Hendy, Pittock, Bygraves, Knight, Lansdale, Langford, Saunders, Webber, Pulling, Daniel. Subs: Lewis (Daniel), Tredrea (Pulling), Momah (Webber), Sharman, Tighe.